The BBC have been at the forefront of the real application of Linked Data techniques and technologies for some time. It has been great to see them evolve from early experiments by BBC Backstage working with Talis to publish music and programmes data as RDF – to see what would happen. Their Wildlife Finder that drives the stunning BBC Nature site has been at the centre of many of my presentations promoting Linked Data over the last couple of years. It not only looks great, but it also demonstrates wonderfully the follow-your-nose navigation around a site that naturally occurs if you let the underlying data model show you the way. 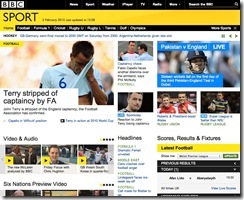 The BBC team have been evolving their approach to delivering agile, effective, websites in an efficient way by building on Linked Data foundations sector by sector – wildlife, news, music, World Cup 2010, and now in readiness for London 2012 – the whole sport experience. Since the launch a few days ago, the main comment seems to be that it is ‘very yellow’, which it is. Not much reference to the innovative approach under the hood – as it should be. If you can see the technology, you have got it wrong. One of the reasons why we are able to cover such a wide range of sports is that we have invested in technology which allows our journalists to spend more time creating great content and less time managing that content. In the past when a journalist wrote a story they would have to place that story on every relevant section of the website. A story about Arsenal playing Manchester United, for example, would have to be placed manually on the home page, the Football page, the premier league page, the Arsenal page and the Manchester United page – a very time consuming and labour intensive process. Now the journalists tell the system what the story is about and that story is automatically placed on all the relevant parts of the site. We are using semantic web technologies to do this, an exciting evolution of a project begun with the Vancouver Winter Games and extended with the BBC’s 2010 World Cup website. It will really come into its own during the Olympics this summer. It is that automatic placement, and linking, of stories that leads to the natural follow-your-nose navigation around the site. If previous incarnations of the BBC using this approach are anything to go by, there will also be SEO benefits as well – as I have discussed previously. 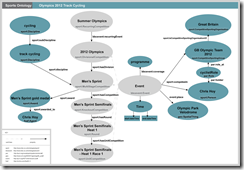 The data model used under the hood of the Sports site is based upon the Sport Ontology openly published by them. 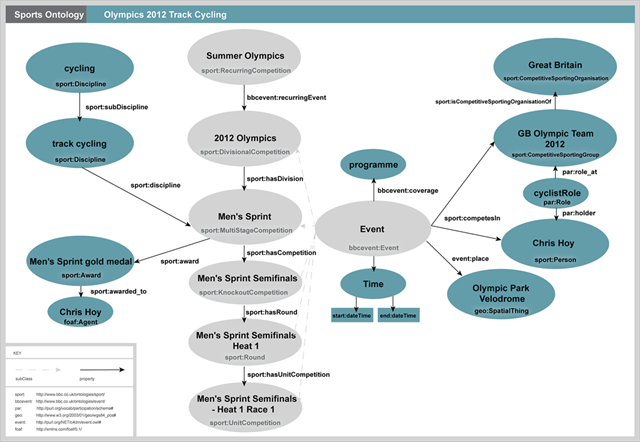 Check out the vocabulary diagram to see how they have mapped out and modelled the elements of a sporting event, competition, and associated broadcast elements. A great piece of work from the BBC teams. In addition to the visual, navigation and efficiency benefits this launch highlights, it also settles the concerns that Linked Data / Semantic Web technologies can not perform. This site is supporting 15 million unique visitors a week and will probably be supporting a heck of a lot more during the Olympics. That is real web scale!